“You can’t have a good summer without growing sunflowers. 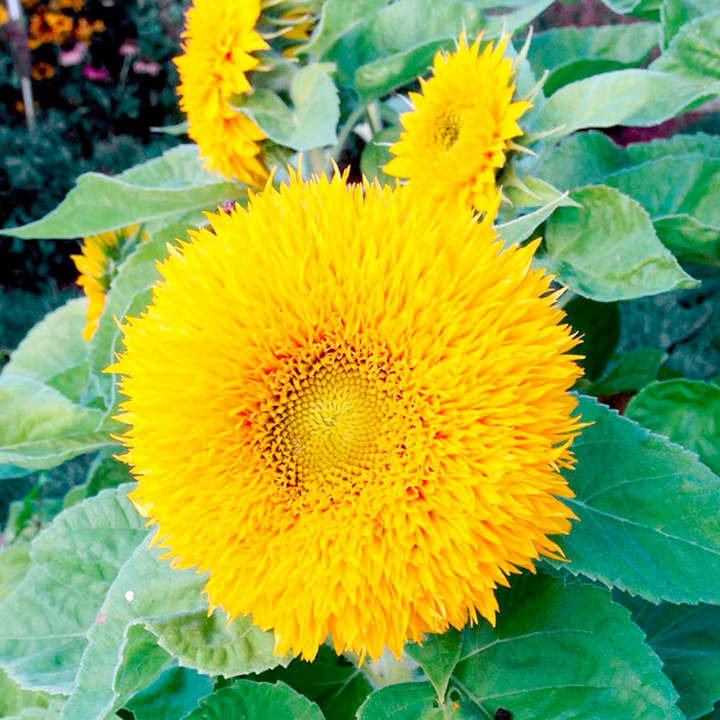 No matter if you only have a balcony or patio, you can grow a few ‘Teddy Bear’ ones. These plants will be thrilled to be in full sun and the centrepiece to your patio. Grow them in 20cm (8”) pots, or the open ground and they will provide you with dozens of fluffy yellow teddy bear heads. Pinch the plants off after they have 3 true leaves and they will branch out, giving you even more blooms which will fill your house with thrills aplenty.” Height 40-60cm (16-24”). Sow the seed thinly in late April-June directly into finely raked, moist, warm, weed-free soil where plants are to flower, 13mm (½") deep.Germination 7-21 days. As the seedlings grow thin in stages to achieve a final spacing of 25-30cm (9-12"). For early blooms sow indoors in April in 7.5cm (3") pots. Carefully acclimatise plants to outside conditions and plant out mid-late May. Grow in a well manured soil in a sunny position and keep moist. Alternatively, you can grow them on the patio in 20cm (8") pots.